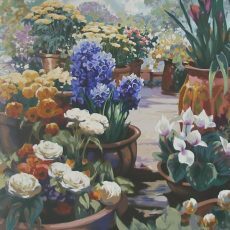 If you love the splendor of flowers and the glories of the pageant of life, you will cherish the paintings of Elizabeth Horning, for she possesses a rare ability to communicate the joy she receives from flowers-and from all other living things-flawlessly, with paint on canvas and paper. Her love of flowering plants has caused her home and most of her paintings to overflow with them; even the trees in her landscapes seem to bloom. But like all true artists, she does not merely copy the beauty of nature; she magnifies it, and thus makes it perfect. Horning was born in Cambridge, Massachusetts, and graduated with a Bachelor of Fine Arts Degree in Painting from the Rhode Island School of Design in 1965. As an undergraduate, she received a Royal Bailey Farnum Scholarship and grants from both the Ford and Carnegie Foundations. Since graduation she has never ceased to study art, and over the years she has attained superb technical proficiency in her craft. Horning began her career in art as a teacher, setting up and implementing art programs in the elementary schools of Franklin, New Hampshire, until 1973 when she moved to the part of the American Southwest where she lives and paints to this day. She has been able to use her artistic talent in numerous interconnected ways subsequent to her move: as an illustrator, as a commercial artist, as an art director of a commercial enterprise, as a designer, and of course as a creator of fine art. In addition, she has been active in artists’ leagues during her entire career, and her works can be found in galleries from Vancouver to San Diego and from Honolulu to New York, as well as in many corporate and private collections, including those of Tanifuji of Japan and Soho Myriad of Atlanta, Georgia. A person who looks at the art of Elizabeth Horning might be tempted to wonder if she is truly content with filling just her own world with blossoms and life, or if she might yearn to give the viewers even more joy, by filling their world with these things, too. But whether or not she has such a yearning, she does in fact lavish upon us an abundant efflorescence of beauty.